Cap Juluca on the island of Anguilla is a 5-star Hotel/Resort. Cap Juluca is consistently cited among the Caribbean's best in Condé Nast Traveler's "Readers' Choice" and Travel + Leisure's "World's Best" awards. 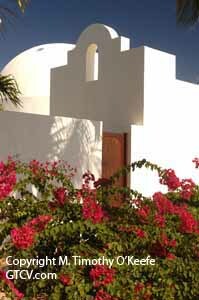 Arches, domes, parapets and turrets in Moorish white characterize the architecture of the resort, which covers 179 acres. This is a small, intimate resort with 18 two-story beachfront villas containing 58 spacious luxury rooms and junior suites, seven suites and six pool villas. All rooms and suites have private, walled terraces with sea views; king-size beds with Frette linen; and some include queen-size double sofas in the sitting room. All rooms are air-conditioned and have ceiling fans, safes, mini-bars with complimentary starter selection and refrigerators. Louvered doors and windows of Brazilian walnut complement the cool tiled floors. Cap Juluca's over-sized villa bathrooms are of Italian Travertine marble and some even have a lounging banquette. Many have double sinks and bathtubs for two with double headrests which look out to a private sunning terrace. 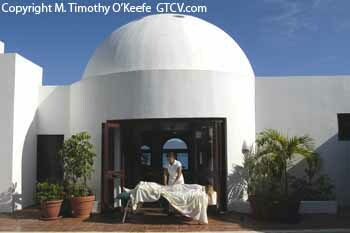 Enjoy a massage beside your villa pool. All have glass-enclosed showers, bidets and dressing areas and twice-daily service to freshen the towels. Private solariums perch on parapets for extra privacy in some upper story suites. Four 5-bedroom and 2 three-bedroom pool villas have private full-size, freshwater swimming pools and sundecks within the suite areas. The villas are beautifully landscaped. Cap Juluca sits along a curved beach bordering Maundays Bay. 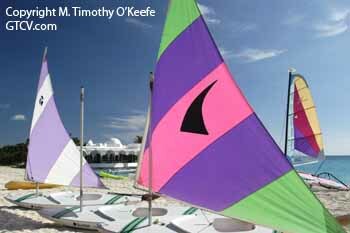 All water sports are complimentary and instruction is provided for windsurfing, sailing, kayaking, waterskiing and snorkeling. The hotel also offers a junior Olympic-sized pool. In addition, guests can play tennis on three Omni-turf courts, two lit for night play, brushing up with free tennis clinics. Private lessons are available with the tennis professional. Day trips with snorkeling can be scheduled to secluded islets and cays on the hotel's 34' power launch, ‘Justice'. Scuba diving and deep-sea fishing can be arranged by Guest Services.